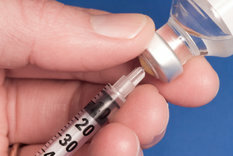 Liraglutide (Victoza) has been shown to reduce more blood sugar when compared to lixisenatide in a new head-to-head clinical trial. The findings, which compared liraglutide and lixisenatide (both in combination with metformin), revealed that liraglutide “significantly” reduced blood sugar, measured by HbA1c, in adults with type 2 diabetes. The results from the LIRA-LIXI trial were announced at the 51st Annual Meeting of the European Association for the Study of Diabetes in Stockholm, Sweden. In the study, people in the liraglutide arm achieved a significantly greater reduction in HbA1c versus lixisenatide (-1.83% vs. -1.21%) at 26 weeks, meeting the trial’s primary endpoint. In addition, more people treated with liraglutide achieved HbA1c targets of <7% (74.2% vs. 45.5%) and ≤6.5% (54.6% vs. 26.2%) compared with lixisenatide. A reduction in HbA1c can provide a huge personal benefit and a significant cost saving through the reduction of complications. For example, a single percentage point drop in HbA1c can lead to a 37% reduction in microvascular complications, a 14% reduction in myocardial infarctions and a 21% reduction in overall diabetes-related mortality. Additionally, Liraglutide demonstrated greater reductions in fasting blood sugar (-2.85 mmol/L vs. -1.70 mmol/L) and mean self-measured blood sugar (-2.64 mmol/L vs. -1.89 mmol/L) compared with lixisenatide. Lixisenatide, however, had smaller changes in blood sugar after eating a meal following injection compared to liraglutide (morning meal: -2.12 mmol/L vs. -0.88 mmol/L and evening meal: -1.88 mmol/L vs. -0.53 mmol/L). Weight loss was observed in both treatment groups (liraglutide: -4.26 kg vs. lixisenatide: -3.67 kg), while systolic and diastolic blood pressure decreased with both liraglutide and lixisenatide treatment (systolic blood pressure: -4.70 mmHg vs. -3.49 mmHg, diastolic blood pressure: -2.62 mmHg vs. -2.69 mmHg respectively). The safety profile in the LIRA-LIXI trial was similar between the two treatment groups. The most common adverse events were gastrointestinal, which included nausea and diarrhoea. No severe hypoglycaemic episodes were reported. Diabetes affects more than three million people in the UK and this is expected to rise to four million in 2025.3 Type 2 diabetes currently costs the NHS over £10 billion per year, with about 80% of this cost because of often preventable complications. These include blindness, amputations and kidney failure.